A Florida-based buyer purchased its first Colorado asset with its acquisition of a Class A office building in Colorado Springs. KAS Partners LLC paid $11.75 million, or $103.43 per square foot, for One Gateway Plaza, a multitenant office building at 1330 Inverness Drive that offered both upside and stability in the city’s southern – and U.S. Department of Defense-heavy – market. 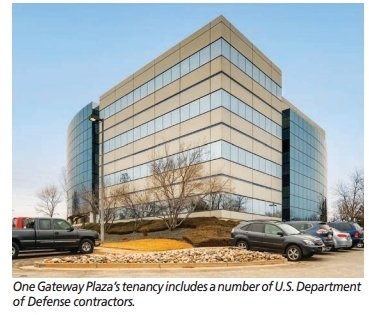 One Gateway Plaza tenancy includes a number of DOD related companies. Its largest tenant is Raytheon Corp., which occupies approximately 43,072 rentable sf and has expanded its footprint in the property multiple times over the course of its tenancy, which began in 1999. The five-story building, sold by Westside Investment Partners, has immediate proximity to Colorado Springs Airport, Peterson Air Force Base, Schriever Air Force Base, North American Aerospace Defense Command and Fort Carson, added Brady, who listed the building with CBRE Capital Markets’ Campbell Davis, and found the buyer. “We’re excited to bring new capital to the market,” added Brady, noting that the majority of interest in the building was from out-of-state investors. “Colorado Springs is seen as a bit of a value play to other markets around the country and, certainly, the buyer got a little better yield going in,” he concluded. One Gateway Plaza, constructed in 1986, was approximately 88 percent occupied at the time of sale. The largest available space in the building comprises 6,500 sf. The 113,604-sf building features an expansive curtain wall façade, extensive lobby and atrium renovations, unobstructed western views, abundant surface parking, 24-hour on-site security and sensitive compartmented information facility space. The seller had made multiple improvements to One Gateway Plaza but the buyer, Brady noted, saw upside in the ability to improve the building’s restrooms, renovations to the parking and filling up the remaining vacancy.